Is this the best ski resort in the Alps? 1. The winding one up from the town to the Gornergrat is a rack railway, which takes you 35 minutes to commute to work. 2. The lift up to Sunnegga is an underground funicular railway & quite fast. 3. The lift to Furi is a gondelbahn which carries on up to Schwarzsee. (Americans note: pronounced Shvartsay, not Shwarzee). These get you out of town. To get to the lifts, there are little electric buses round town. You want the ones with green bumpers. The red bumpers are on the suburban buses. 4. For Trockener Steg (means the 'drier track'), get off at Furi & take the cable car. At Trockener Steg, you can get another cable car up the Klein Matterhorn at 3800m. Some people may have altitude trouble there but they do keep oxygen at the top. There is no way of knowing if you are suseptible to altitude problems short of going up (i.e. the hard way), as general fitness is no guide. This is the way to Italy. 5. If you ski below Trockener Steg, there is a cable car back up from Furgg & also a weird gondola arrangement which goes to Schwarzsee, an essential home link, see below. 6. Above Sunnegga, there is a gondelbahn to Blauherd & from there, a huge cable car up the UnterRothorn. More about lifts on this side below. 7. From the Gornergrat, a cable car goes to Höhtalli & another on from there to the Stockhorn. There is plenty for 'early skiers' in Zermatt on blue runs. However, there are also plenty of red & black runs, which more or less conform to the grading used in most other resorts. There are also "routes", which are marked in yellow on the map. These are either very hard blacks or something in a league of their own. Some are marked "only for good skiers", meaning very good. I always pick my way cautiously down these runs. They sometimes have 'one choice' skiing, i.e. only one place to turn, & they are all very steep. You need to be very fit to bomb down them. I always start here, because the fields down to the Riffelberg provide a good 'warm-up' area after a year off skis. There are a variety of easy routes & the Ghifthittli chairlift much of the way back. 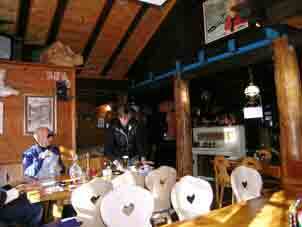 (Not all the way: for a rotten lunch in the Gornergrat Hotel, you will need to catch the train). From the Ghifthittli chairlift, you can repeat the easy runs or turn right at the top & ski down the Kelle (Kelly's Gully to the English but it means 'cellar'), a nice red run & you need to schuss about 2/3 the way down the actual gully to avoid walking up the other side. This run eventually goes near the Grünsee Hotel (lunch available) & on the Gant. 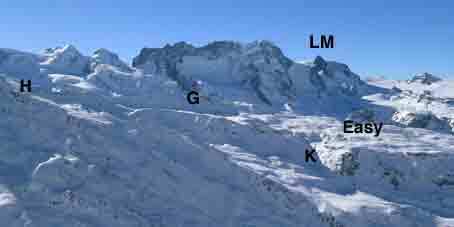 Easy = Ghifthittli, K = Kelly's Gully, LM = Little Matterhorn. 1. a cable car back up to Höhtalli to either go back to the Gornergrat or back down again on the White Hare run to Gant on the left of the picture above, reddish & delightful. Some way down, our first "route" goes off to the right. This is Mittelritz & like a very hard black. From Höhtalli, you can take the Stockhorn cable car for some "route" experience down the Trift Glacier. In fact, the Stockhorn runs would pass as black. There is a drag lift up to the Rote Nase & a short cable car to Höhtalli. Photo next page. 2. From Gant, a gondola goes up to Blauherd, getting you into the UnterRothorn area. The Gornergrat connects both ways & to get to the Trockener Steg & Schwarzsee areas, one skis off to the right below Riffelberg on a wide gangway below the railway avalanche sheds & then left across alps (meadows but there are many different words for 'meadow' in this agricultural area) to the Riffelalp. Below the Riffelalp are the Ritti meadows which take one down to below Furi. This is a red run. As Furi comes into view, it is obvious that a short walk is involved. Photo right: Simi's Café on this bit, recommended for lunch. If there is much snow, schuss as far as you can, ignoring the 'end of piste' sign by the road, then walk up the road to a tunnel in the cliff on the left in which, oh blessing!, there is a lift up to the Furi station. There is now a lift back up to the Gornergrat area from here. Last revised 2/6/2012 © 1998-2012 Ken Baldry. All rights reserved.